The Secret Science Club: Evolution Revolution! 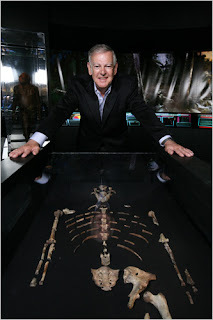 The Secret Science Club presents Donald Johanson—the discoverer of Lucy—at the Bell House, Tuesday, July 14 @ 8 pm, FREE! Evolution Revolution! The Secret Science Club presents Donald Johanson—the discoverer of Lucy—at the Bell House, Tuesday, July 14 @ 8 pm, FREE! Make your bones at the Secret Science Club. . .
Our species, Homo sapiens, is a mere 200,000 years old (give or take). Where did humans come from? How did we evolve? And what were our ancestors like? Fossil hunters have been asking these questions ever since Darwin developed the theory of evolution. And in the last few decades, we've been getting some pretty amazing answers. One find revolutionized the world's thinking about early human origins: In 1974 paleoanthropologist Donald Johanson discovered the bones of Lucy—a 3.2-million-year-old early hominid—in the Afar region of Ethiopia. With about 40 percent of Lucy's skeleton intact, she represented a new species, Australopithecus afarensis. 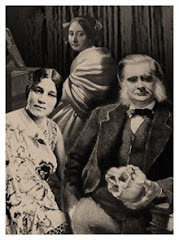 --How many hominid species existed prior to humans—or even co-existed with humans? What were their habitats and behaviors? --When did hominids begin to walk? When did big brains develop? --Have fossil hunters located the common ancestor of humans and chimps? --Why is Homo sapiens the only hominid species that survives? --Try our cocktail of the night--the "I Love Lucy!" Special thanks to the Houston Museum of Natural Science for bringing Dr. Johanson to New York City and making his appearance at the Secret Science Club possible. Great time last night! Do you ever make lectures available for podcast?